and added: “And I can say I feel proud to have played in Sochi. I enjoyed the journey.Magnus played a better match. This is his moment. Congrats”. More reactions from top players: via @chess24.com: “Aronian: “I’ve never seen a World Championship match with quality games. They’re over-prepared so they commit mistakes during the games”. There was a closing ceremony on Tuesday. Why can’t the winner of the match get his medal and trophy after the last game? Is it really necessary to organize a 30-minute ceremony, two days after the last game? @anandcarlsen14: “Medals awarded to the players by President Putin are made by FIDE/Agon and Adamas, Russia’s premier jewelry company”. @TarjeiJS:” I can imagine at least one person who is bored to death now. 34 minutes delay and counting”. @MarkTwic: “I don’t know about other people but I’m kind of getting bored now”. @ChrisBirdIA: “Carlsen gets a nice shiny gold medal, a big trophy and a Christmas wreath, just in time for the holidays”. @Pookita: “I know it’s tradition but that wreath belongs on a door somewhere – or maybe on a horse that just won”. @seitenschach:“Probably something Magnus Carlsen wanted to avoid: Putin speaking at the closing ceremony “. But Vishy disagreed: @vishy64theking: The ceremony had 2 great performances by young artists. The rock guitarist all of 13 years was excellent”. And where will the next world championship be played? 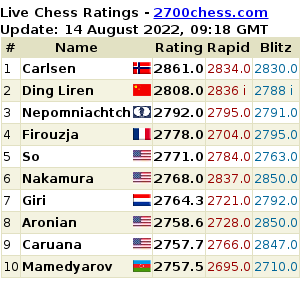 @chessmike: “Kirsan Ilyumzhinov announces 2016 World Chess Championship will be in USA.”….